For over 100 years, Mitchell 1 has been a leader in providing information solutions that simplify everyday tasks for automotive professionals — helping make their jobs easier. Through the years, Mitchell 1’s products have evolved to keep pace with industry and technological advances. The renowned Mitchell Manuals led the way to the industry-leading Mitchell ON-DEMAND® solution, recognized by generations of auto repair professionals as the standard for automotive repair information. Repair Information — ProDemand® optimized with SureTrack® helps auto repair technicians save time with complete OEM repair information and exclusive real-world knowledge delivered in a single lookup. Shop Management — Manager™ SE is a complete business management solution that tracks shop activity from estimate to invoice, and includes all the tools that shop owners need to manage their business operations, customer service and repairs more profitably. Shop Marketing — SocialCRM delivers powerful loyalty marketing services like targeted promotions, verified customer reviews and social media and email marketing campaigns to help auto repair shops retain current customers and acquire new ones to build their businesses. Estimating — ProDemand® Estimator helps shop managers and service writers build their estimates accurately the first time with labor times and parts pricing for a huge selection of domestic and imported vehicle models going back to 1983. Commercial Truck — TruckSeries is the only comprehensive repair information software suite of its kind available for Class 4-8 trucks, delivering a one-stop, single log-in, all-makes data resource with scalable wiring diagrams, digital pictures, DTC-to-diagnostics, and so much more, all delivered in seconds. Heritage — Nobody has been providing information to auto service professionals longer — or does it better — than Mitchell 1. With almost a century in the industry, our rich heritage gives us a unique perspective and ability to deliver products that truly solve problems for our customers. Innovation — Continuous innovation means always pushing to be better and deliver more value to customers. We are passionate about developing new ways to help our customers improve the way they do business. Stability — We were here yesterday and we’ll be here tomorrow. As a Snap-on company, we have the infrastructure and resources to meet our objectives for today and continue to innovate for the future. At Mitchell 1, our customers are at the center of everything we do. We listen and bring solutions to market that truly simplify their tasks and improve efficiency so they can not only fix more cars, but also grow their bottom line. Plus, we’re car people, so we understand the challenges auto repair shops face. And we know that improving efficiency is essential to increasing productivity — and ultimately, profits. For more information about Mitchell 1 products and services, browse the company website or call 888-724-6742. 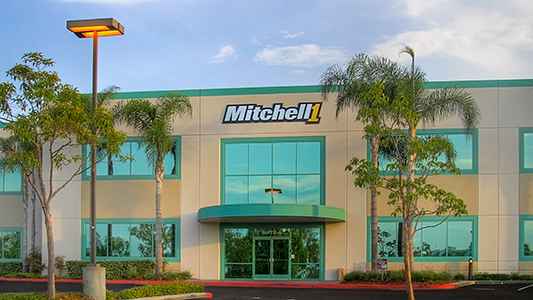 Mitchell 1 is located at 14145 Danielson St., Poway, CA 92064.